Reading the Fantastic Four comics from the start. This week it’s issue #342, which is forgettable, and #343, which has a notorious reputation. After a one-page intro, issue #342 is a flashback story, taking place a short while ago, when the team was Ben, Johnny, Sharon, and Crystal. Johnny befriends Rusty Collins of X-Factor, who has similar fire powers. They reach out to a group of troubled teens and some guys in high-tech battle armor. Spider-Man has a funny cameo where, between paychecks, he shows up raid the fridge at FF headquarters, promising to pay them back later. I guess it’s not a bad comic, but it’s obviously a deadline-mandated fill-in issue, and nothing more. It’s the Fantastic Four with guns! Huge, gigantic guns! These were the days of Jim Lee on X-Men, Todd McFarlane on Spider-Man, and internet punching bag Rob Liefeld on X-Factor, and so on. 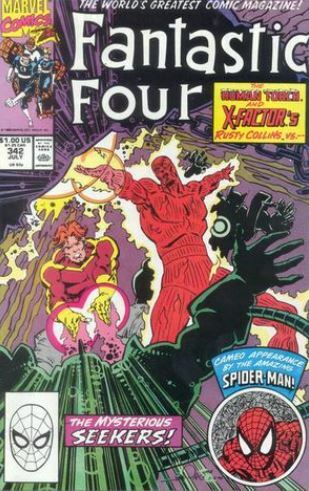 Comics had this reputation of being super-EXTREME, and many have accused this and subsequent issues of Fantastic Four as being an attempt to similarly be super-EXTREME. But is that what’s really going on in these issues? Let’s find out. At the end of the previous story arc, the FF returned home from time traveling thinking all was well, not knowing they are in an alternate timeline where U.S. President Dan Quayle and Soviet Premiere Josef Stalin are on the brink of nuclear war. 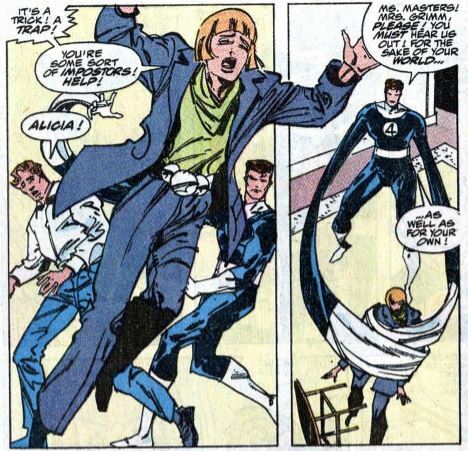 This issue begins with them still not knowing, making jokes about doing the laundry after a trip away, while Reed puts Johnny through some tests to make sure he’s okay after having his mind taken over by Nebula. Sharon is the only one who suspects something is up, thinking that her memory is playing tricks on her. 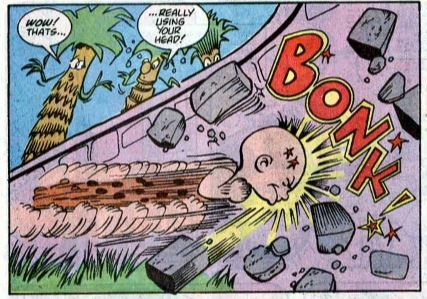 Sue calls the Power family (of Power Pack fame), who were babysitting Franklin, only to learn the Powers do not live or work in New York. Ben picks up a newspaper to check the sports scores only to learn about Quayle and Stalin. Our heroes compare notes and finally realize they’re in an alternate timeline. To further illustrate that point, Alicia shows up, revealing that she and Ben are married in this timeline. Alicia freaks out upon learning that this isn’t her FF, and she wonders where hers are. While all this has been going on, we’re following Moscow and the White House at odds, each one gathering troops and wondering which will (or should) strike first. Air raid sirens go off in New York, announcing that a nuclear strike is inevitable. Alicia says her timeline’s Reed was at work on a plan to stop the war, so “our” Reed gets to work on the same plan. The team then boards the FF’s pogo plane and flies off toward the German border, where the Russian troops have gathered. The next four pages of the comic become a mini Tom Clancy novel, with the U.S. Armed Forces doing cool U.S. Armed Forces stuff as they prepare for battle. 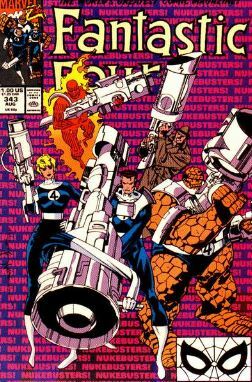 Still in the plane, the FF pulls out those huge guns from the cover, as Reed says they’ll stop World War III… or die trying. Unstable molecule: The alt-timeline’s pogo plan has stealth capability and more powerful rockets, which Reed says he’d like to add to his own plane once the team gets back home. Fade out: Is it sexist to have Sue complaining about doing the team’s laundry? Yeah, it is. We all enjoy when our heroes do “ordinary family” stuff to balance the “cosmic adventure” stuff, but this is a bit much. Flame on: Johnny wants Reed to hurry up with the tests, so he can watch Twin Peaks. I wonder if 2017 Johnny is pro-Dougie or anti-Dougie. Fantastic fifth wheel: Alt-timeline Alicia initially mistakes Sharon for Ben, which is either a wacky joke or some impressive forward-thinking gender fluidity. The Alicia problem: Is Alicia secretly Lyja the Srkull in this timeline? 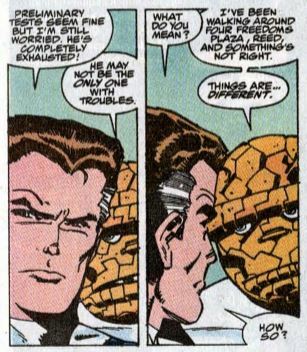 There’s no way to know, but she’s certainly quick to assume that the FF are imposters when she discovers Ben is human. Trivia time: The Official Handbook of the Marvel Universe designates this alternate timeline as Earth-9061, for those who care about such things. Fantastic or frightful? So far, this story is your basic alternate universe sci-fi action, and not really the ‘90s Image Comics-style extremism as is its reputation. It’s mostly set-up for things to come, though, so we’ll see.